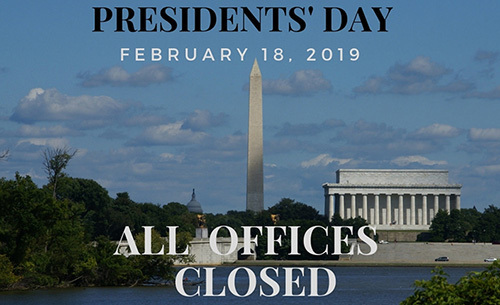 On Presidents’ Day our offices will be closed BUT our 24-hour kiosk is ALWAYS open! Stop by the North Branch, 8830 N Union Blvd, to renew your vehicle registration. Get your year tab, registration & payment receipt immediately. *The North Branch has Saturday hours 8 a.m.-1 p.m. The 2019 holiday schedule for the El Paso County Clerk & Recorder’s Office is shown below. Our office will be closed on the following days.